Oobleck has been a science-class favorite of mine ever since I first encountered it in the 6th grade. With only a few simple ingredients, you can create this amazing quicksand-like substance that you won’t be able to stop playing with! *Note: If you want to make a larger portion of oobleck, the ratio is 2-parts cornstarch to 1-part water. 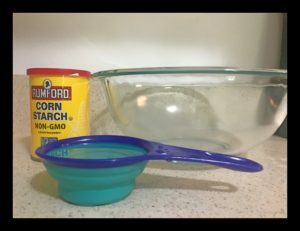 Pour cornstarch into a large bowl and sift with a fork to ensure that there are no clumps. 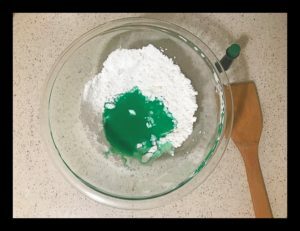 If you plan on using food coloring, put a few drops of food coloring into the water in a separate bowl and stir until the water has changed its color. Pour the water into the cornstarch and stir. You can begin stirring with the spoon, but you will eventually need to use your hands to mix everything together. To make sure that you have the right consistency, try to gather some of the solution into your hand. It should be a solid when you have a tight fist, but it should turn back into a liquid once you release your grip. The idea is that the substance is a solid when force is applied, but a liquid when there is no force applied. If your substance is too watery, add some cornstarch. If it is too hard, add a little bit of water. Matter is divided up into five states, three of which you are probably very familiar with – solid, liquid, and gas. Each state of matter has specific qualities based on the proximity and viscosity (resistance to flow) of the particles in a substance or object. For example, the particles in solids are close together and maintain their own shape, while the particles in liquids are more spread out and take on the shape of their container. 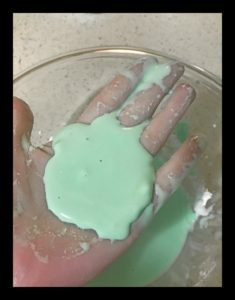 Oobleck is known as a non-Newtonian fluid, which is a fluid whose viscosity constantly changes based on the forces (such as heat and pressure) that are applied to it. You can see this principle at work simply by adjusting the amount of pressure you apply to the Oobleck. If you give the substance a hard tap, it immediately has a high viscosity and becomes a solid. But if you slowly insert your finger into to substance, the viscosity is much lower and is like putting your finger into a bowl of liquid. 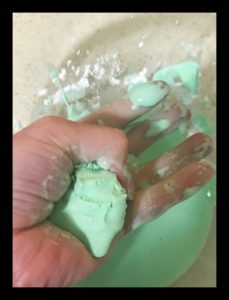 If you really enjoy playing around with the Oobleck, try making a large quantity of it and filling up a storage tub or kiddie pool and see if you can run across without sinking! This is such a fun experiment for kids and adults too!